Are You a MOTY’s Kid? Do you ever meet those people who you know just pour themselves into this life for their kiddos? 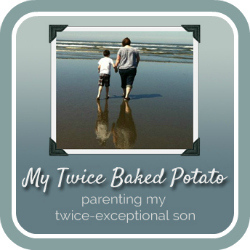 When I started talking with Kelly of My Twice Baked Potato, I was touched by her heart and soul for her son, and for her passion for the work she does in this world through her jobs as teacher, mother, and blogger. Kelly was a ParentMap 2013 Golden Teddy Award finalist for parent blog. She started her blog as a way to share information about the unique needs of twice-exceptional kids, because there wasn’t the available information she needed when she found out that her son was a 2e. Head over to her blog and read more about her life and her experience. Bottom line? Kelly cares and she is giving back. In my book, this makes her very boss, and I can’t wait for you to read her post below about why she is a Mom of the Year, or as she says “great mom for her son.” Kelly, I admire you and thank you for sharing! 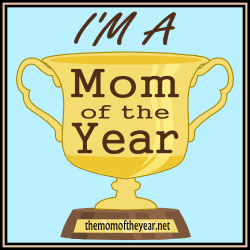 Before I was a parent, I was confident that I could judge a slacker mom from a Mom of the Year nominee anytime…anyplace! During my years of judgment, I had developed a quick checklist of observations that confirmed if a mom was truly MOTY-worthy! 1. Her children were clean and stylish. They had clean clothes, clean faces, clean hands and their hair was recently trimmed. Mom and kids all looked like Abercrombie models. 2. Her children were smiling. Not only are they put together fashion-wise, their pearly whites are always showing! It didn’t matter if they were in Target or Trader Joes…they were happy, smiling little people! 3. Her children enjoyed family meals…especially in restaurants! Going out to dinner as a family was a treat and one that MOTY’s children appreciated. There was no need for electronic distractions. These children sat in their spots without climbing over booths, arguing, or running around in the restaurant. They colored their menus (sharing the crayons and complimenting each other on their artistic choices) as they patiently waited for their meals. 4. Her children had a full schedule of activities and classes. Although MOTY’s Kids had lots of friends, she planned ahead for extracurricular activities; karate, baseball, piano and Kumon. If you really wanted time with a MOTY’s little ones, you were encouraged to quickly sign up for the upcoming Saturday Martial Arts class! 5. Her children benefitted from her Pinterest obsession! Her Christmas cards were clever and the children proudly awarded their teachers back to school presents that turned heads! She could transform a mason jar into anything! In the past, my control freak nature helped me through busy, chaotic times. After becoming a mom, it seemed the harder I tried, the more control I lost! Why wasn’t my son following my schedule and playing by my rules?! I couldn’t understand why my kid pulled off all the prices in the aisles at Trader Joes! I frantically tried to attach them back in their proper place, all the time paranoid of stares that I received from other shoppers. Looking back, I might have thrown a few behind some bags of potato chips…maybe. Real or imagined…I felt like all eyes were on me as we had to changed our food order to ‘take out” because of tantrums in restaurants. I knew that other MOTY candidates were watching and marking me down on that part of the competition for sure! When my son was younger, I had to make a daily choice which one of us would leave the house clean. Some days…he was the “chosen one” but by the time we actually got to the car, you wouldn’t know it by looking at him. Honestly, it took me a really long time to have confidence in myself as a parent. It took me even a longer amount of time to realize that I shouldn’t care what that woman in aisle 4 thought of me as a parent! Looking at my previous MOTY criteria list, I now realize that those things that I thought were important are completely superficial. They have no bearing on someone’s parenting! The things that I do for my child, that I am most the proud of…cannot be “seen” with a brief glance. My ability to be a good mom is only “seen” through my child’s growth, character & happiness. I encourage him to try new things and take risks. I have developed more patience than I ever knew was possible! I laugh with him and celebrate his creative sense of humor! I love him unconditionally and tell him all the time! I understand that he is unique…introverted, bright, quirky & sensitive! I may not be THE Mother of the Year, but I am a great mom for my son.